The pillow in the bottom left corner was sewn together by my mother. The quilt square was cut from an old, falling-apart quilt that was handmade by my paternal great-grandmother. My sister added the ivory border around the quilt block and hand-quilted it before my mother made the pillow and ruffling. This pillow is one of my most cherished possessions so I had to include it in my family scrapbook. That is how I came up with the idea of using it for a title page. 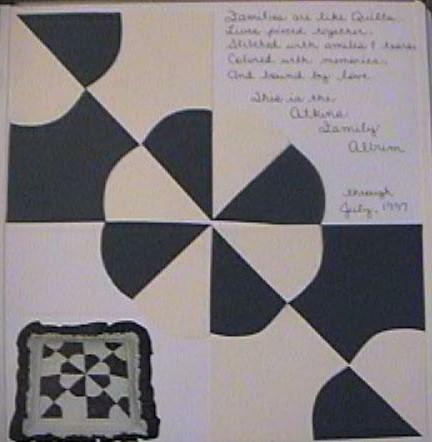 I made the page similar to the quilt pattern and included a "family" poem. I love this page!!! !